Cam Newton was selected first overall in the 2011 NFL Draft by the Carolina Panthers. The quarterback won the Heisman Trophy and a national championship while at Auburn University. Peyton Manning was an All-American quarterback at the University of Tennessee before being chosen No. 1 by the Indianapolis Colts in 1998. We all know the caliber of career he had in the NFL. While players like Newton, Manning and countless others dominate the headlines and spotlight, there are many players, if not more, who are relative unknowns. Ryan Spadola falls into the latter category. Spadola, 25, is a relative unknown. He didn’t come from a successful high school football program. He didn’t play at a Division I program in a major college conference. His games weren’t broadcast on national TV every Saturday. He wasn’t drafted into the National Football League. Yet here he is in the same league as players like Newton, J.J. Watt, Odell Beckham Jr. and Tom Brady. Spadola’s journey, though, was different. It was anonymous. ‘There’s the easy route where you’re fortunate enough to be born with the athletic ability, you go to a place where you showcase that, get a free ride (athletic scholarship) to a big school and have the spotlight on you so everyone sees what you can do,’ Spadola said. ‘Then there’s the road the majority of the people like myself have to go through. You take those steps and overcome every obstacle put in front of you under the radar and then still get to the same spot a lot of the big-name guys are at. Football had always interested Spadola. He grew up surrounded by it, whether it was his friends playing it or his father, Donald, coaching it. He viewed the sport as an opportunity to spend time with his friends and have fun. Spadola did just that at Freehold Township High School in New Jersey with no anticipation of continuing his career at collegiate level. It’s why he had no qualms with stepping away from the game as a sophomore to focus on track. But it was at this moment when he came to a realization. Spadola didn’t garner much attention from coaches at the next level though. Smaller, non-scholarship schools, particularly in the Patriot League including Lehigh University, Lafayette College and College of the Holy Cross, expressed interest. Like his realization when he stepped away from football as a sophomore, it was when Spadola visited the Lehigh campus in Bethlehem, Pa., that he knew what he wanted. The transition from high school to college wasn’t easy for Spadola. The increased workload in the classroom and on the field, being on his own and the higher level of competition took some getting used to. Spadola, though, adjusted. He had 78 catches for 1,130 yards and nine touchdowns as a sophomore and it was at an evaluation meeting with offensive coordinator Dave Cecchini and wide receivers coach Jason Miran when he realized his true potential. Cecchini, who had coached other players who played in the NFL, including receiver Andre Roberts, saw something in Spadola. 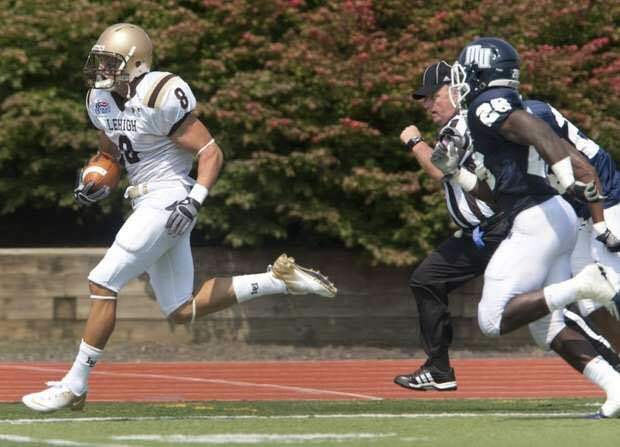 Spadola had a record-setting junior season at Lehigh and began garnering interest from NFL scouts. 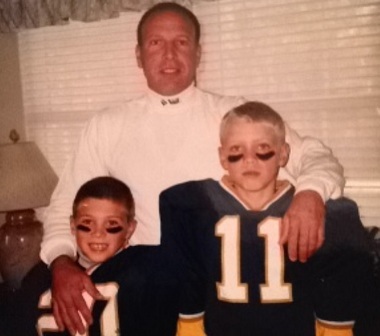 Even though he didn’t get drafted after his senior season, he signed a free agent contract with the New York Jets — the same team he had seen in person countless times when he was younger with his father and younger brother Randy. Being a rookie in the NFL is hard enough. Being an undrafted rookie makes it even tougher. Undrafted players aren’t guaranteed money compared to those who are drafted. Undrafted players are therefore more expendable. Yet, Spadola continued to showcase his talent and skill set. He was labeled as the ‘feel-good story of (Jets training) camp’ in 2013. His roster spot had to be earned. It wasn’t guaranteed. Toward the end of the summer ahead of Week 1 of the regular season, NFL teams must reduce their rosters to a maximum of 75 active players. A few days later, they are cut down to a max of 53 players. 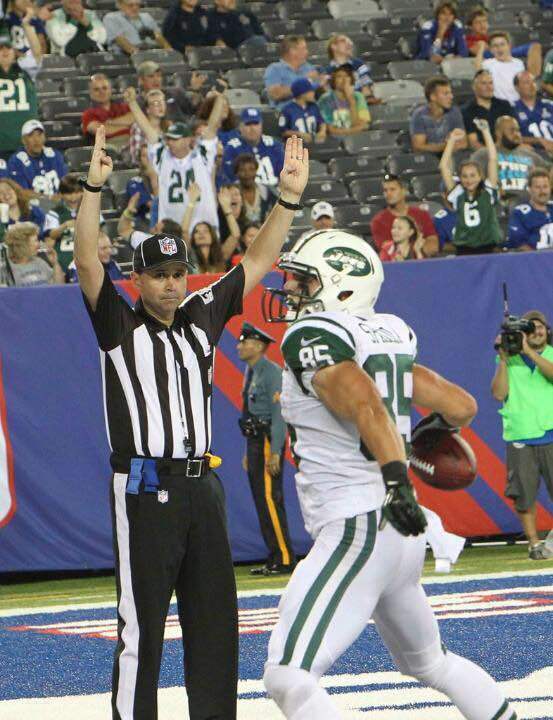 Spadola would be one of those 53 for the Jets’ 2013 regular season. He played in three games. ‘Making your first NFL team undrafted your rookie year, which I did, looking back is mind-blowing,’ he said. ‘What people don’t realize is once you make the team, you aren’t guaranteed anything. Even though I was on the 53-man roster, I was probably 52 out of 53 in terms of money invested and, I guess, importance to the team. I was a young guy, easily expendable. Unfortunately, the harsh reality of the NFL, as Spadola referred to it, came to the forefront. Players can get cut for a myriad of reasons, including ones out of their own hands. That happened with New York. Because of a slew of injuries on defense and the need to acquire replacements, Spadola was a casualty. A staff member approached him at his locker that fateful afternoon. He was told to report upstairs with his playbook. After a player is released, there is a 24-hour dead period where other teams can claim him to their active roster. Once that time is up, the team that cut a player can re-sign him to their practice squad or another team can sign him to theirs. Three days after being released by the Jets, Spadola signed with the Miami Dolphins to their practice squad. Receiver Brandon Gibson tore his patella tendon and would miss a significant portion of the season. There was now a spot on the active roster available. Spadola proved he deserved it. He was promoted to the active roster and played in the 22-20 win against the Cincinnati Bengals on Thursday Night Football on Oct. 31, 2013. Unfortunately, that same harsh reality of the NFL resurfaced. Spadola had been dealing with abdomen pain, but for fear of missing significant time due to the injury, kept playing through it. He would receive anti-inflammatory Cortisone shots, but after a second opinion found out he had two tears in his abdomen and surgery was required. Following surgery and rehabilitation, Spadola landed on the practice squad with the Atlanta Falcons during the 2014 season. He was cut two months later after a veteran receiver became healthy. Spadola signed with the Arizona Cardinals later that season to their practice squad, but a dislocated finger in the 2015 preseason ended that relationship. 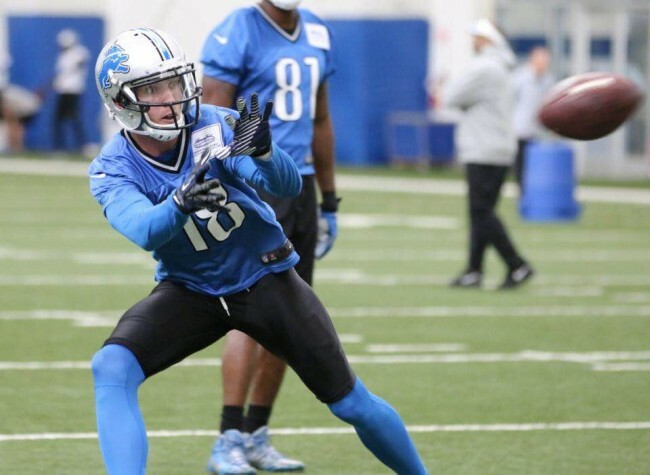 He signed with the Lions’ practice squad during the 2015 regular season. An injury, a poor performance or a change in system or coaching staff are all events that can change the course of a player’s career. A player can go from being a lock on an active roster to a free agent, anxiously waiting for his phone to ring with another opportunity. To make matters more complex, money, especially for a practice squad player, isn’t guaranteed. If a player is on a roster for two weeks during the regular season, he gets paid for those two weeks. NFL players receive a weekly paycheck during the 17-week season that has to last them the entire year. A practice squad player making $6,000 a week who gets cut after 4 p.m. Tuesday (when each NFL week begins) of Week 3 earns $18,000 that season if he can’t find another job in the league. That has to pay rent, buy groceries, pay for a car and support a family in some cases. It’s the NFL. It’s more than the three hours seen on TV on Sundays. Spadola is currently on the Injured Reserve after suffering a pectoral tear in the second day of practice with Detroit. He is expected to miss six months. Because he is still on the team’s roster, he continues to receive a paycheck, though only a certain percentage of what he could have been earning if he was healthy. With another year left on his contract, Spadola is anxiously awaiting his return to the field with his teammates in anticipation for the 2017 season. Don't believe everything you see on the screen -- even at a film festival! The eighth annual Kicking + Screening soccer film festival began with that very message at the Scandinavia House in New York City on Tuesday night. Konspiration 58 (Conspiracy 58) is a Swedish short film that claims the 1958 World Cup in Sweden was all fabricated.